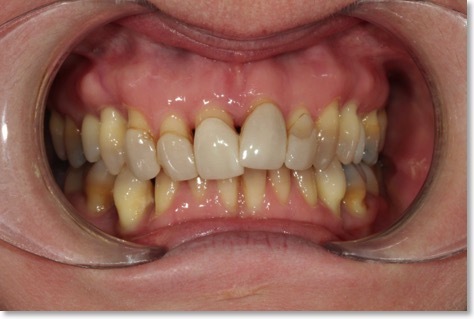 This case demonstrates correction of a smile that was gummy, had teeth worn down by tooth grinding in the past and spaces that had been closed by a previous dentist using composite filling material. 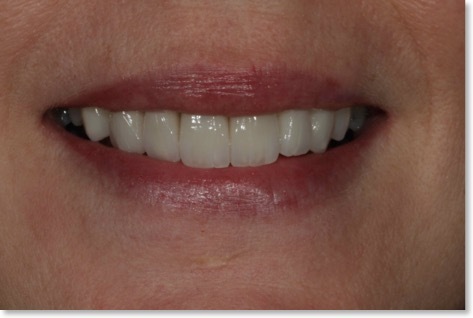 The case planning begins with photographs and models to plan the ideal correct proportions and smile lines. 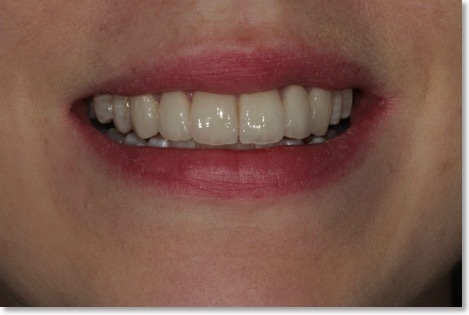 The final result was planned using models and photographs of the smile and lip contour. 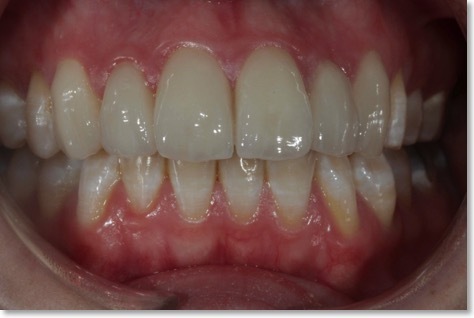 Here minimal preparation veneers were possible and colour matched to the whitened teeth elsewhere ion the mouth. 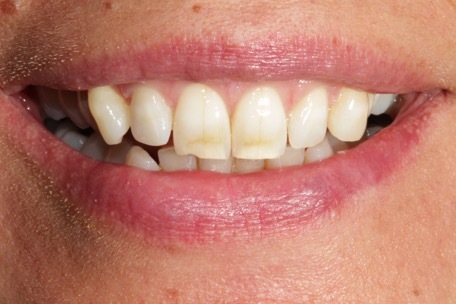 The patient raised the shade of her teeth by several levels on the value scale. 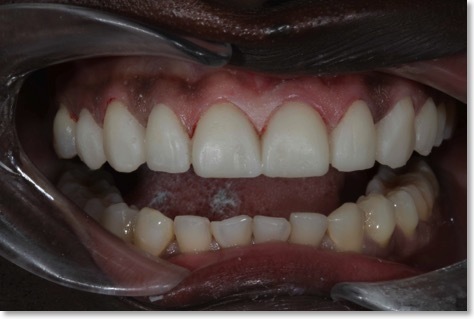 This will be easy to maintain long term with occasional top up applecations of whitening possibly once per year. 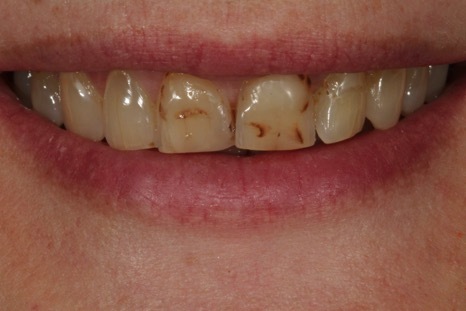 Prepared teeth pic 1; The trial smile wax up was used to guide minimal preparation of the teeth. 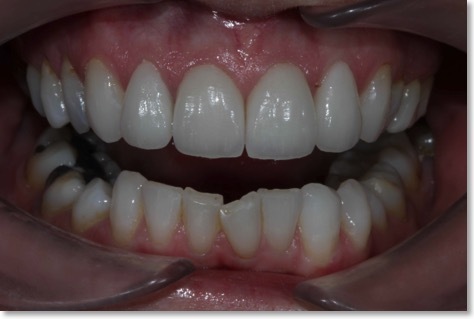 The preps were so minimal, I managed to remain within the enamel layer which is very important for long term health of the teeth and also creates the best bond to the veneer. 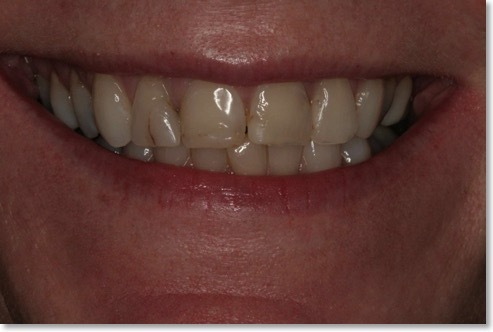 The picture on the right shows the temporary veneers fitted made from the diagnostic wax up models. 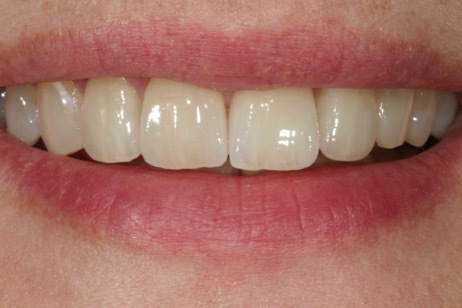 final veneers fitted. 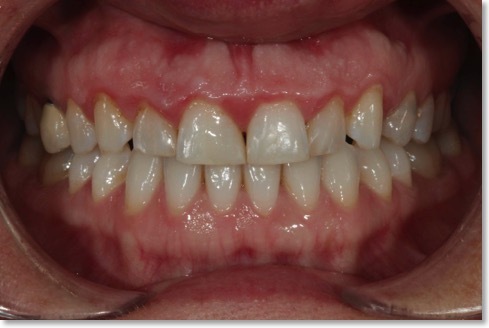 This case shows how even with a wide midline gap (diastema) full closure is possible whilst maintaining great gum contour and health. 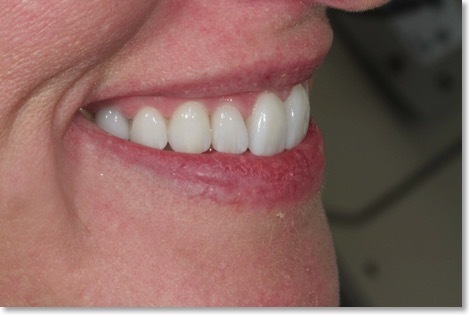 The patient chose a shade lighter than his original teeth and then proceeded to have whitening on his lower natural teeth later to catch up with the new veneers. 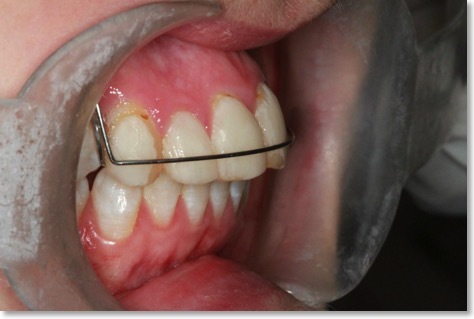 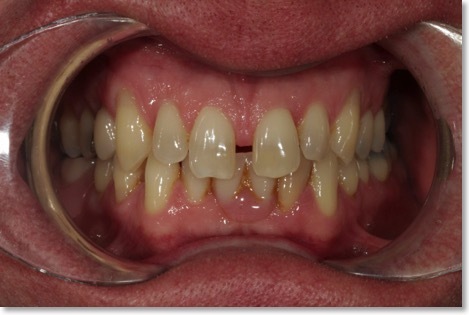 This patient had composite bonding by his previous dentist to attempt to close the wide gaps between his teeth. 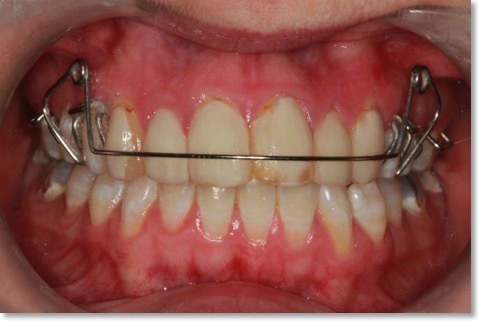 Bonding can be useful in cl;owing small gaps but this example shows inappropriate choice of technique. 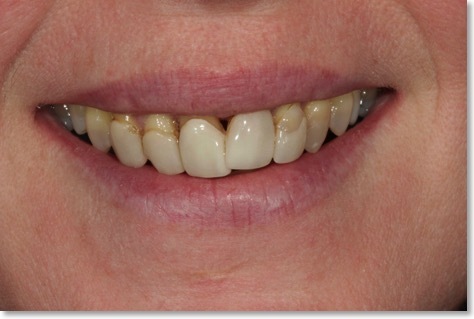 When closing large gaps, only ceramic veneers will be strong enough to last long term. 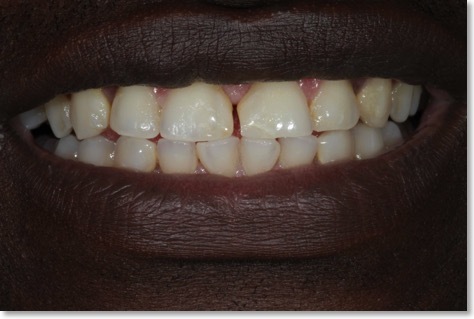 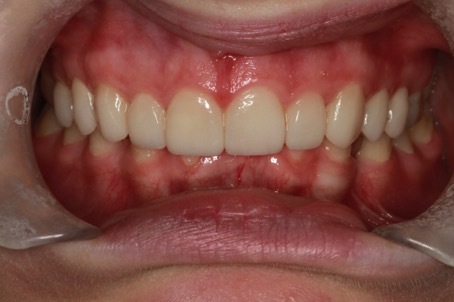 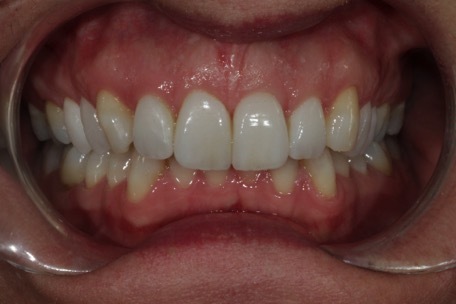 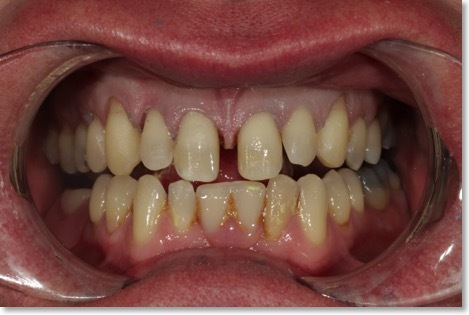 The case was planned using diagnostic wax ups to create a ‘trial smile’ for patient approval. 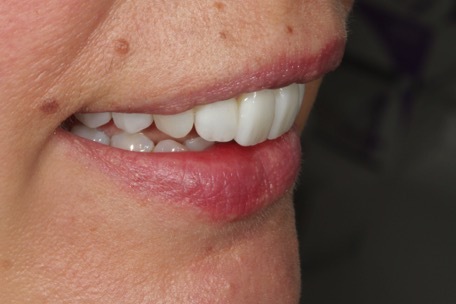 This can be worn for several weeks so that the patient can decide if they like the look, feel and phonetics of their teeth before finals are made and fitted. 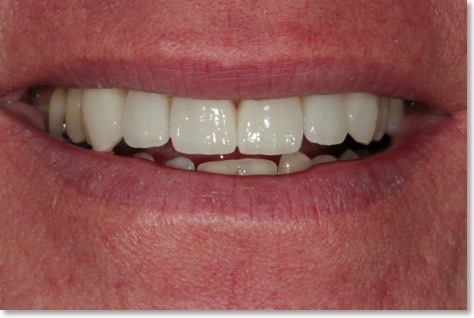 the final veneers made according to the approved trial smile. 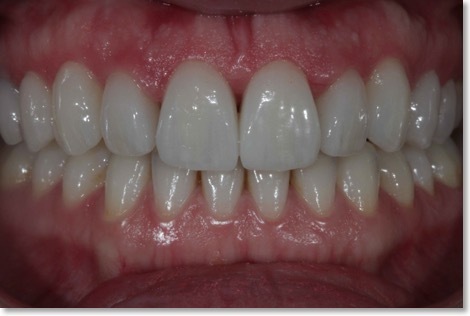 Not the closure of the wide midline diastema gap whilst maintaining perfect gum profiles. 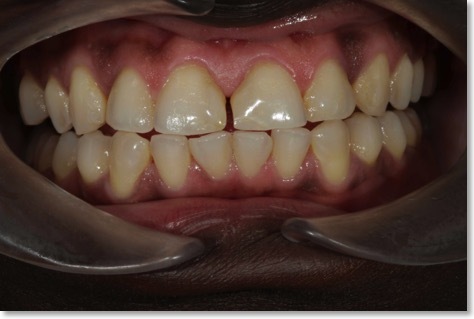 This case presented a challenge from a design point of view and the previous dentist’s failure to deal with the problem highlights one short coming of composite bonding namely the difficulty in closing wide spaces. 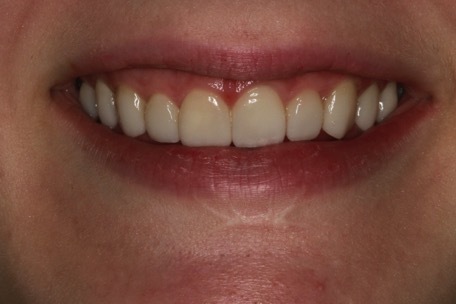 The gums in this case needed some modification using an electro-cautery technique to sculpt the shape at the zenith area of each tooth as well as in between each veneer. 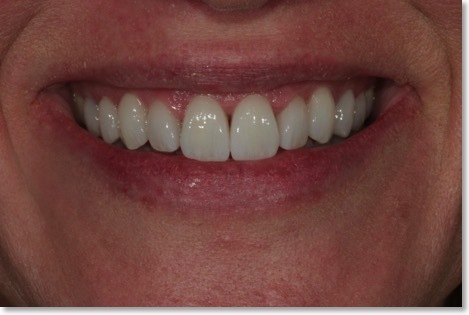 The final smile consisted of Elite level cosmetic ceramic veneers designed to fit the lip contours and smile lines. 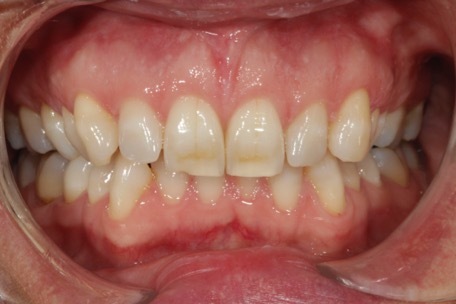 This patient suffered acid erosion from dietary causes and a previous dentist repaired this using composite bonding but didn’t do a satisfactory job. 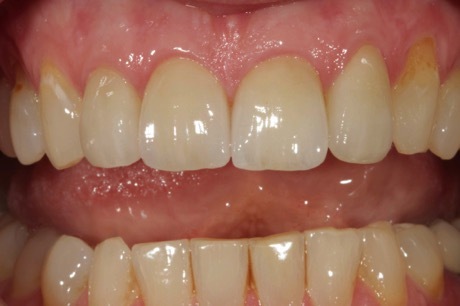 In order to correct the problem the patient could have opted for new bonding with an anticipated lifespan of around 5 years or minimal preparation cosmetic ceramic veneers. 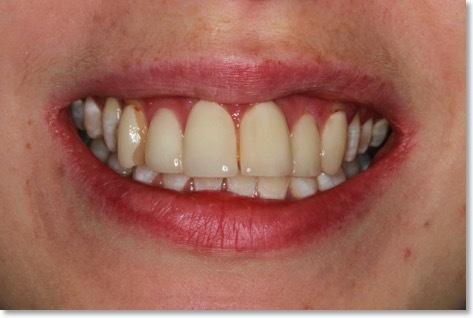 The decision was made to prepare the 4 upper front teeth for minimal preparation Elite level cosmetic veneers. 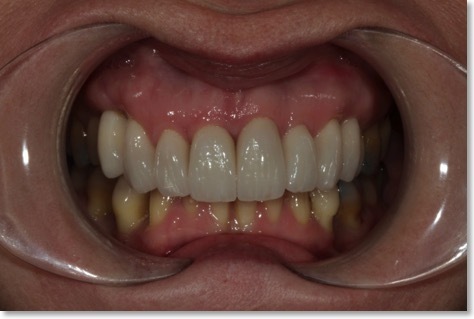 The rest of the teeth were whitened first to lift the colour by around 4 shades before matching in the new veneers. 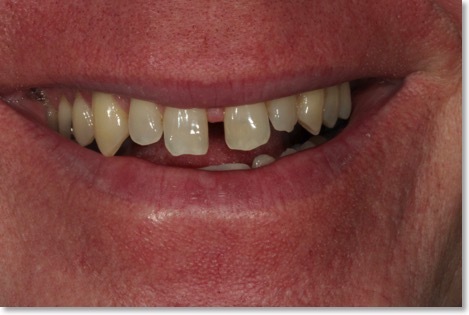 As with all my work I created a natural look and in this case we selected fully natural characterisation. 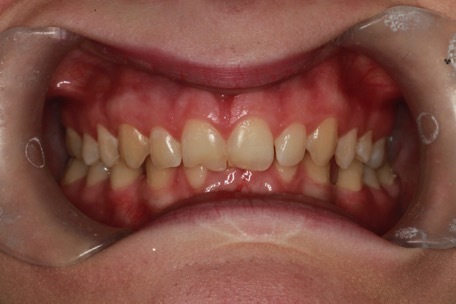 This case shows a young patient in her early twenties who was unhappy with the appearance of her teeth in terms of shape, size and colour. 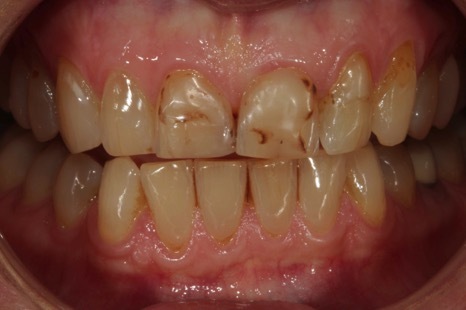 Due to her young age I did not advise any preparation of the healthy natural teeth. 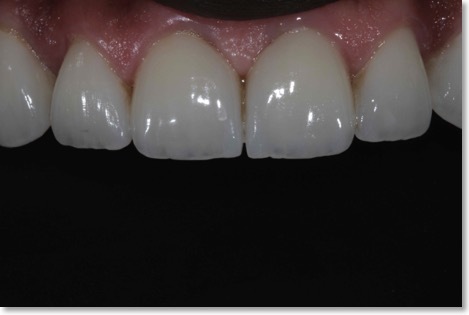 We discussed the alternative of composite bonding versus ceramic no-prep veneers and the veneers were selected. 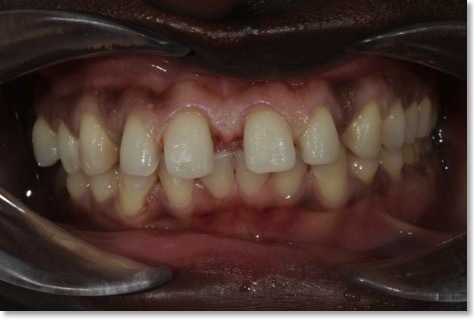 The critical area to consider when providing this treatment is the join between the veneer and tooth at the gum level. 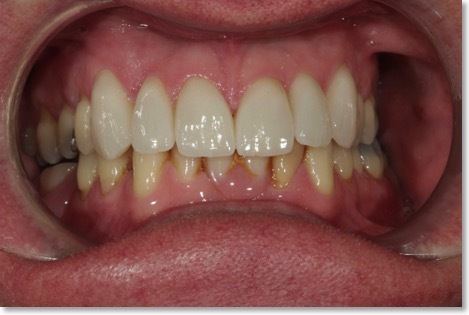 Poorly fitting veneers create inflamed gums but here as you can see the gums are in perfect health. 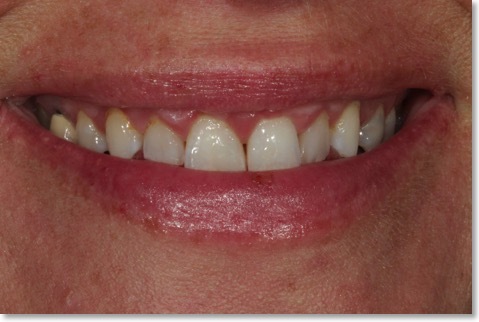 This patient was aware of her upper canine teeth dominating her smile and looking ‘fang like’ and disliking the overall unevenness of her smile. 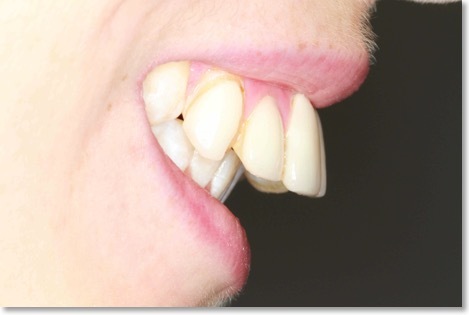 After an analysis of the smile, it is clear that the problem lies with the teeth in front and behind of the canines which tilt inwards creating the prominent canine look. 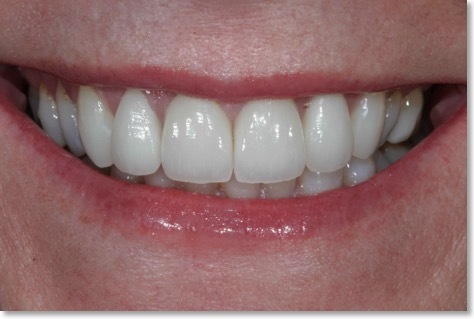 Zero preparation veneers were designed and made resulting in no drilling of the healthy teeth whatsoever. 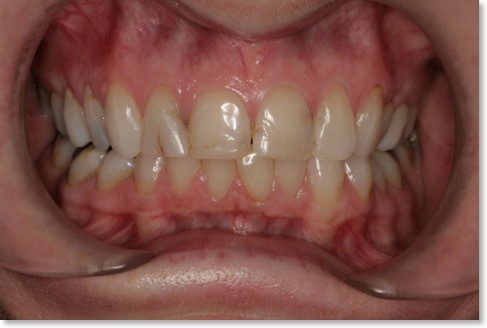 This is an ultra-conservative way to improve the smile in the right circumstances. 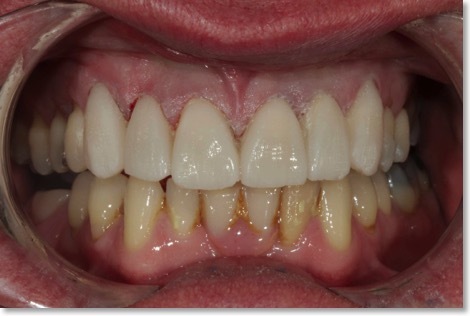 Not all patients are suitable for zero prep so a thorough assessment is key to the process. 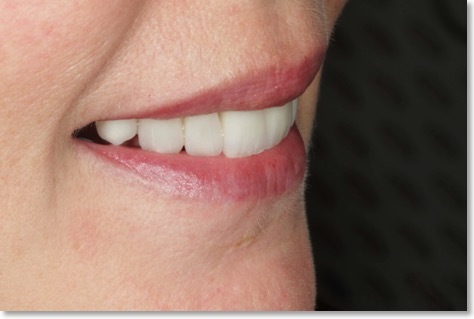 The final veneers ideally match the patients smile and lip lines for a natural look.